Started this page when researching the Sidewinder missile (Wiki) developed by China Lake Naval Weapons Center (Wiki). This missile uses IR guidance. See the Related paragraph below for more IR and optical devices. It turns out that the Navy was behind the VT Fuze (Wiki) and that they both depend on a radio fuze that functions in a very similar manner. That's to say a three dimensional map of the trigger envelope comes close to a three dimensional map of the shrapnel. 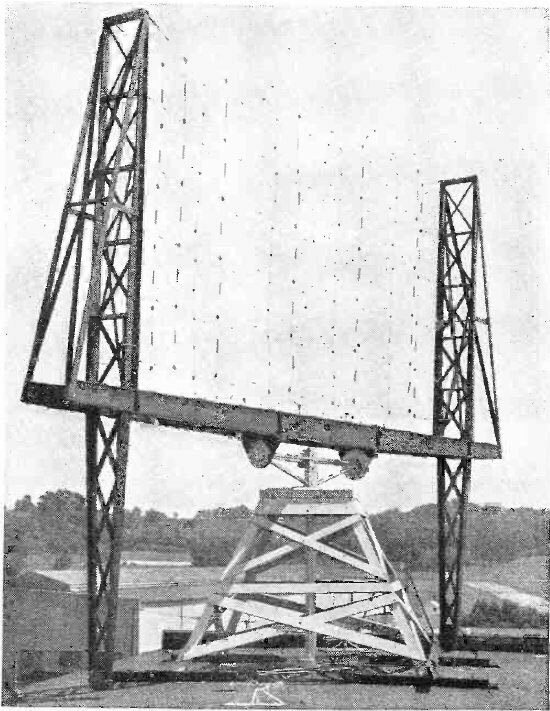 Note that this first RADAR was not pulsed, but rather a CW (Wiki) type more like a Doppler RADAR (Wiki). The SD RADAR (maritime.org) used on subs early in W.W.II only had an "A" range (2 to 30 miles) display, not the PPI (Wiki) rotating type display. 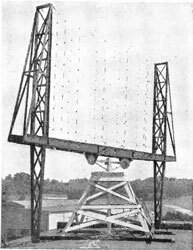 In 1943 the SJ RADAR with PPI display was introduced. 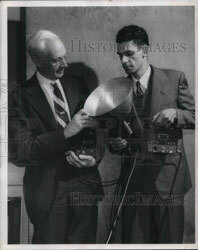 "General Electric's motion detector, using the principle of the VT fuze, is displayed here by W.C. White, left, Research Laboratory electrinics engineer, and H.S. Lasher, a research engineer. 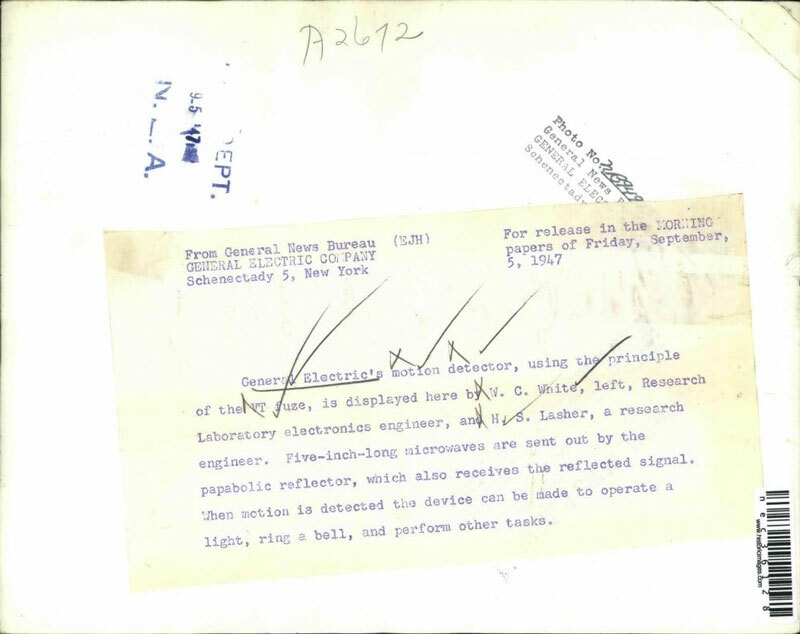 Five-inch-long microwaves are sent out by the papabolic (sic) reflector, which also receives the reflected signal. When motion is detected the device can be made to operate a light, ring a bell, and perform other tasks." 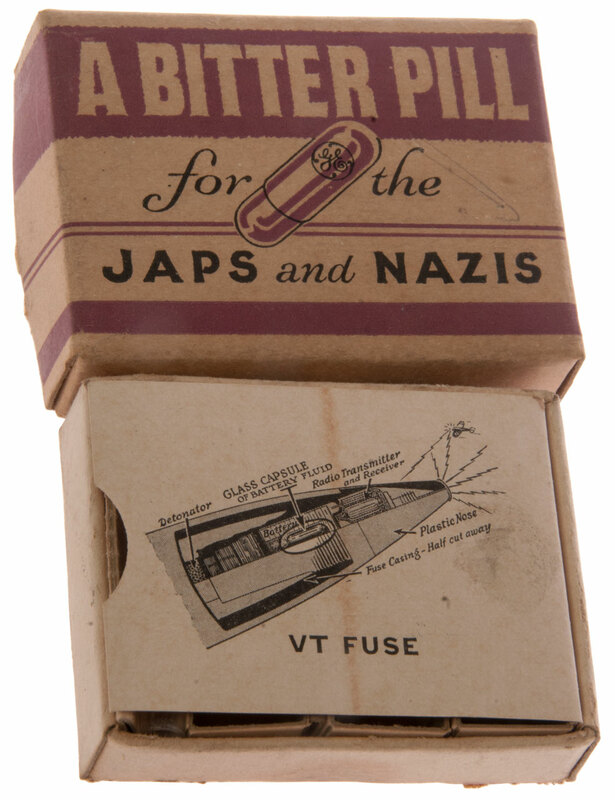 In "The Deadly Fuze" (Ref 1) it's mentioned that British worked on a Photo Electric Fuze (as did the U.S.) so I searched for patents related to that and there are a lot of them. 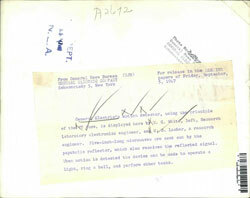 Some of them where the publication date is about 20 years after the filing date indicating that they were classified secret. 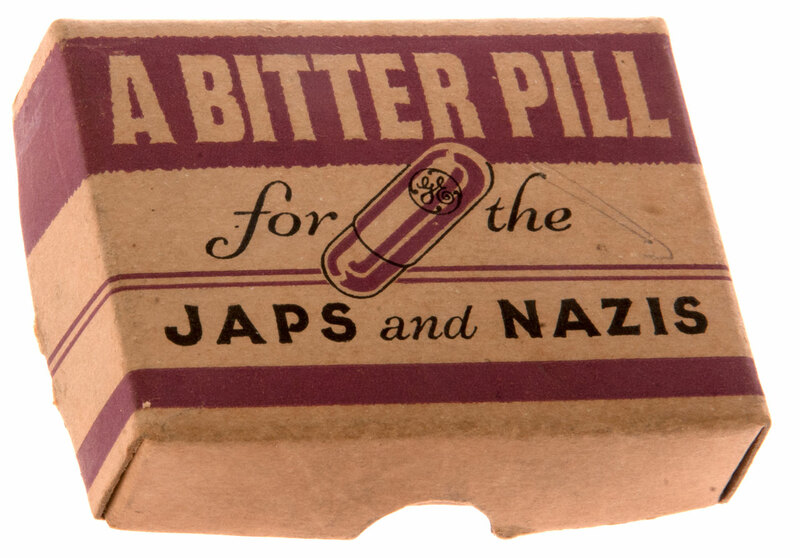 The level of detail indicates that they may be been manufactured in production quantities, probably for some special application. Note that the Sidewinder missile uses thermal IR for guidance and so a PE Fuze that was sensitive to thermal IR would work very well and not be susceptible to jamming. Note that proximity fuzes can be used on different platforms. Bombs and rockets experience much less acceleration than artillery shells. Also bombs and rockets do not spin at all. So the early work on proximity fuzes was done on bombs and rockets and then later, as high-G components were developed, they applied to shells. While there are patents the have illustrations that look like production VT fuses, I think 2959128 and more important 3001476 are the heart of the magnetic proximity fuse based on the time delay between the priority date and issue date, i.e. top secret classification. These patents are about antennas that can stand the very high wind velocity of projectiles and not vibrate. The method of operation is to have a magnet (either electro or permanent) and a coil to sense a change in the magnetic filed. This is very different from the "magnetic influence" exploder used on W.W.II torpedoes which did NOT work. YouTube: Flak Training for Pilots in WW 2 - T.F. I-3389, 1944 - no mention of lethal radius, i.e. how far the burst needs to be for safety. Vertical: roughly 1000 feet per second, if 50 foot lethal radius then timing accuracy of 50 milli seconds needed. There are two aspects how repeatable are the shells and are they set to the correct time delay. The proximity fuze was developed to solve this problem. 1948-1953 AAM-N-5 Meteor Air to Air missile semi active RADAR 8.9"
AIM-9 Sidewinder Air to Air missile designed to shoot down bombers, not fighters. 1983 - now Tomahawk missile Surface ship or submarine to ground Terrain Contour Matching (Wiki) ? In addition the China Lake folks also patented civilian ideas like garage door openers, headlight dimmers, &Etc. This is one of the modular components of the proximity fuse. It's my understanding that all of the proximity fuzes use the same reserve battery, setback switch, Centrifugal switch and I suspect other components so that they do not need to be engineered for every new project. 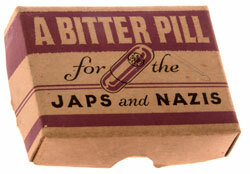 Capsule to hold reserve battery electrolyte. 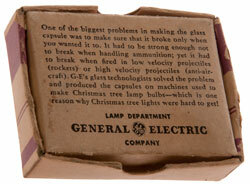 This is a promotional item made by GE. There were other promotional ads, like for the vacuum tubes that would survive being fired from a gun. If 30 million were made over 2 years that's about 40,000 per day. Somewhere else I read that Christmas tree lights were impossible to get (the box says "hard to get"). 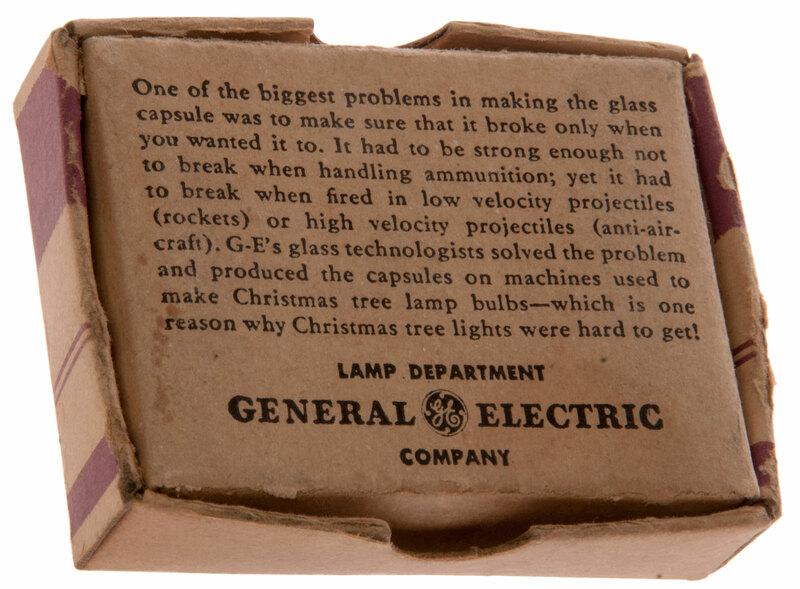 Fuzes designed for artillery make use of the very high G forces to break the glass capsule allowing the reserve battery to operate. It's not clear to me what activates the reserve battery in a bomb or missile proximity fuze. reason why Christmas tree lights were hard to get! The glass tube at left is 0.2465" OD (probably called 1/4"). The bulbs are about 5/8" diameter x 1.4" long. Note can be used against aircraft or ground targets. Projects at China lake (it's not easy to correlate the patents with their project). The below table is in more or less chronological order based on patent issue date. Most patents are granted within a range of the same year to a few years after the application. 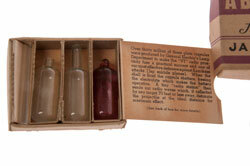 If the subject is a SECRET then the publication is delayed, in some cases forever, or other cases up to 40 years. So whenever there's a long time delay between application (or priority) date and issue date something special may be going on. PS It's probable that most patents are granted on Tuesday. Be suspicious of a patent date that is not Tuesday. a precursor to the Radio based fuze. Doppler type "where the position of moving targets are determined" by changes in frequency of received signals." This may be the 2.75" aircraft launched rocket. Note the Bazooka (Wiki) 2496316 also used a 2.75" rocket.